WA’s wine is famous the world over – and soon the state could be known for another premium drink. 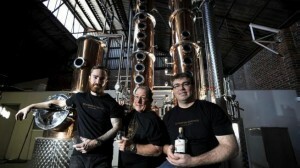 Brothers-in-law Alasdair Malloch, 31, and James McKeown, 26, are behind Australia’s first dedicated bourbon-style whisky distillery, in an East Perth warehouse. The story behind their Whipper Snapper Distillery dates back to World War II. As a university student renting a flat in Scarborough, Alasdair struck-up a friendship with an elderly neighbour, “Vic”, who flew Lancaster bombers during the war. “It was done on a small-scale, but it was great fun,” Alasdair said. After travelling in the USA and Scotland seven years ago, Alasdair returned to Perth with the idea of establishing a distillery here. The industrial relations consultant and his brother-in-law, a surveyor who worked on WA’s mines, quit their jobs to pursue the dream and tracked down Tommy “Coop” Cooper, a relative of the American pilot who had inspired their journey. Coop had owned an award-winning distillery in Colorado and agreed to put his retirement on hold to teach the pair the science of whisky making. The final piece of the puzzle was to rope-in Scottish distiller Frank McHardy, recently inducted into the Whisky Magazine Hall of Fame. By law, bourbon must be produced in the USA, so Whipper Snapper promises to create an “Australian salute to bourbon” with corn from Kununurra and wheat from a farm near Narrogin. Coop, 66, said the secret to a good whisky was “patience”. “You have to wait until the temperature is right, you have to wait until the taste is right. If you just don’t rush it you will get a quality product at the end,” he said. James said a “whisky revolution” was happening in Australia with more drinkers, and in particular women, making it their drink of choice. “Some drinks go out of fashion, like a sherry or a brandy, but people will always appreciate a whisky. It’s a staple that will never go away,” Alasdair added. Last year Whipper Snapper raised $500,000 to purchase and install the initial production equipment, including a gleaming copper pot still and new American white oak casks. The first drink to hit the shelves will be a moonshine whisky named Crazy Uncle which will sell for about $60 a bottle and be targeted at the 25-45-year-old market. It’ll take another two years of ageing for the $70-$80 bourbon to ready, while the first of the $90-$100 Scotch-style single malts will go on sale in 2017/18.